We bring you a comprehensive and up to date spoiler service on all the major US TV shows and Movies. You can find specific show content by clicking the menu system at the top of the screen. We scour the Internet for spoilers as well as posting our own exclusive spoilers (Scripts, Casting Calls, Set Photos etc) as well as recaps and other fun articles and polls. We hope you enjoy your stay. If you require any help with SpoilerTV, please don't hesitate to contact us but please check the links below to see if they will help you first. See if your show is safe! 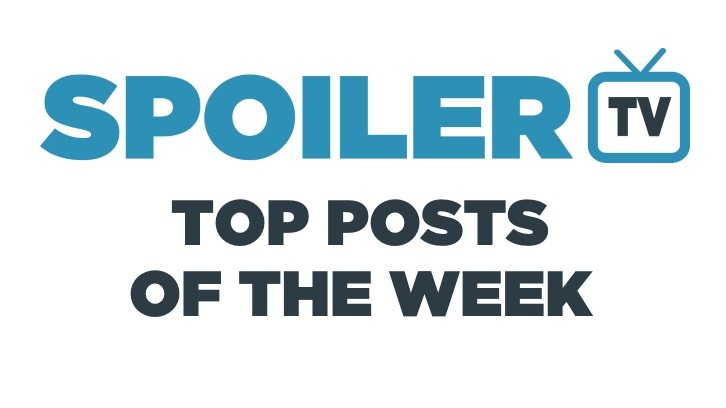 Here are the Top 30 most viewed posts of the past week here at SpoilerTV in case you missed any of them. - We don't include Ratings News Posts in the list below. - The number to the left of the post title is the number of times the article was read last week. 1 3,289 The Punisher - Cancelled by Netflix? 30 892 POLL : What did you think of Supergirl - Suspicious Minds? Every day 100's of items are submitted to us and we don't always have the time to make separate posts for the news and/or there is so much that it would quickly push all other items off the homepage. So a result we've come up with the idea of the Newsreel, which will feature smaller shows and news items as they happen. There will be a new Newsreel each day, and as news is added we will update the post and and push it back to the top of the site so that you can see that new items have been added. A tweet of the item will also be sent to our @SpoilerTV account. New Items will be listed at the top of the article. Rather that creating lots of new posts as new info is released and fragmenting the commentary, we thought it would be a good idea for the upcoming major movies to create a single post for each major movies that will collate all the info as it's posted. New items will be added to the top of the list as well as the post being re-posted back to the top of the homepage when a new item is added. We will additionally send out a fresh tweet alerting you of the new information. This will allow you to bookmark this page so that you can return to it whenever you like. It will also help consolidate all the discussion on this movie in a central place and make it less likely that you'll miss some key information.